Colin has a range of talks and lectures on both magic and ventriloquism. Talks; these are suitable for a lay audience as no tricks are exposed, although he does teach a simple trick or two for you to take home. These are a fun evening, or afternoon, of history, stories and performance. Colin supplies everything he needs for the talks apart from a cup of tea! Lectures; are designed for magic clubs where Colin will teach not only the methods behind the tricks but the business and other subtleties that make them work. To The Magic Circle and Beyond! In this talk, travel with Colin on his unusual journey from learning his first magic trick at nearly 30 to becoming a member of The Magic Circle. Share some of his all time favourite tricks including the act he performed to pass The Magic Circle exam, yes, you have to take an exam! Find out the trick he will never do again! Plus everyone will go home with a simple trick they can amaze their friends with. 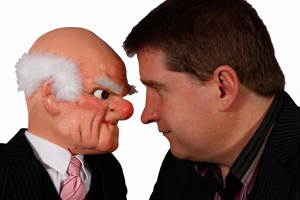 As one of the few professional ventriloquists in the country Colin’s talk on ventriloquism features a short history on the art, dispels a few myths, and shows how it should be done! You will meet his side kick, Snot The Dragon plus a few other characters. This is a great evening full of fun and laughter. Some say that ventriloquism is a dying art but Colin thinks it has just been hibernating and is slowly waking up in the 21st century! For Prices and Availably Contact Colin Today! Colin is currently working on a new lecture for 2016.